Coventry-based Stoke Plant Hire Ltd has taken delivery of a 40-tonne Volvo EC380E in mass excavation configuration with an A30G articulated hauler on order for a long-term hire contract at a sand and aggregates quarry on the outskirts of Burton upon Trent. The new 40-tonne excavator has been specified with 800mm track pads, a 6.2 metre boom, a 2.6 metre dipper arm, hydraulic quick hitch, a 2.5m³ mass excavation bucket and a grading bucket. It will be put in charge of loading aggregate as dug into various sizes of Volvo articulated haulers operated by Stoke Plant Hire. 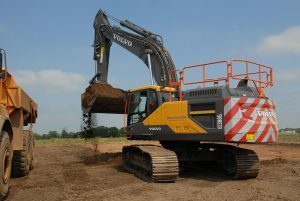 This is the second Volvo excavator to join Stoke Plant Hire’s fleet, following a smaller EC250E supplied two years ago. “We’ve been very impressed with the performance and reliability of the EC250E and it’s been much appreciated by our operators so when we needed to replace one of our larger units, opting for the Volvo EC380E made perfect sense,” says Operations Director, Brendan Doherty. The Stage-IV Final 13-litre engine featured in the EC380E develops 306 nett hp and is ideally matched to its automatic sensing mode hydraulic system. The machine’s hydraulics is perfectly matched to the engine and is controlled by an advanced system which provides on-demand flow and reduces power losses within the circuit. As well as improving fuel efficiency, this increases controllability for more precise performance. Otherwise, Volvo’s integrated work-mode system offers the operator a choice of five work states according to the task in hand – I (Idle), F (Fine), G (General), H (Heavy) or P (Power max) – for optimum efficiency and machine performance. 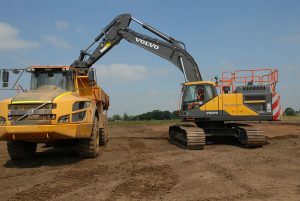 Soon to join Stoke Plant Hire’s fleet of equipment will be a Volvo A30G which will work alongside the company’s existing trucks on a long-term contract for a major sand and gravel company on the outskirts of Burton upon Trent. The A30G hauler – powered by an electronically controlled, six-cylinder 264kW turbo charged Volvo V-ACT diesel engine – features high torque at low engine speeds, resulting in good fuel efficiency and high performance. Purpose built by Volvo, the engine is designed to exactly match the Volvo drive train, ensuring the best use of power and torque, even in tough working conditions. Delivering exceptional fuel efficiency, it is matched to a torque converter with built-in lock-up function and fitted with a fully automatic fast adaptive transmission. The rest of the Volvo designed and built powertrain has been reinforced to cope with the higher torque output of the engine. With a carrying capacity of 28 tonnes and heaped capacity of 17.5m³ the Volvo A30G has a maximum speed of 53kph. The hauler is also fitted with CareTrack as standard, which is Volvo’s telematics system that enables remote monitoring of a wide range of machine functions (e.g. location, fuel consumption, service reminders, etc) thus optimizing customer operations. Currently celebrating thirty years of trading experience in earthmoving, Stoke Plant offers its clients outstanding expertise and service, priding themselves on the excellence of their facilities and equipment, and the knowledge and commitment of its staff. Based at Binley Woods, Coventry, Stoke Plant has a large, modern fleet of machines and can complete projects from 5,000 to 5-million cubic metres. Brigade Showcases New Radar for OEM and Specialist Applications.